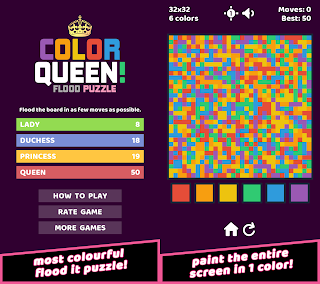 Home » color-queen-flood-puzzle » Color Queen! Flood Puzzle, the most colourful puzzle game released on Android! Color Queen! Flood Puzzle comes with multiple game modes, board sizes, color options, royal titles, and also refreshing flood audios (with sound on/off button). You can also change the background with day theme and night theme. ★ 4 game modes with different board sizes and color options and nobility titles: Color Lady, Color Duchess, Color Princess, and Color Queen! ★ Refreshing Flood audios with Sound on/off button. ★ Autosaved highscores on each mode based on the fewest number of moves you achieved. ★ Reset board whenever you need to start a new fresh colour puzzle! - Start: You flood it from the top left corner. - Tap the color box below the board that you want to flood it. Red, Orange, Yellow, Green, Blue or Violet. - Paint the entire field with one colour. Try to flood it in the least amount of moves! Let's Play Color Queen! Flood Puzzle and Challenge your puzzle game skills with this exciting skill game! Flood it with addicting Color Queen! 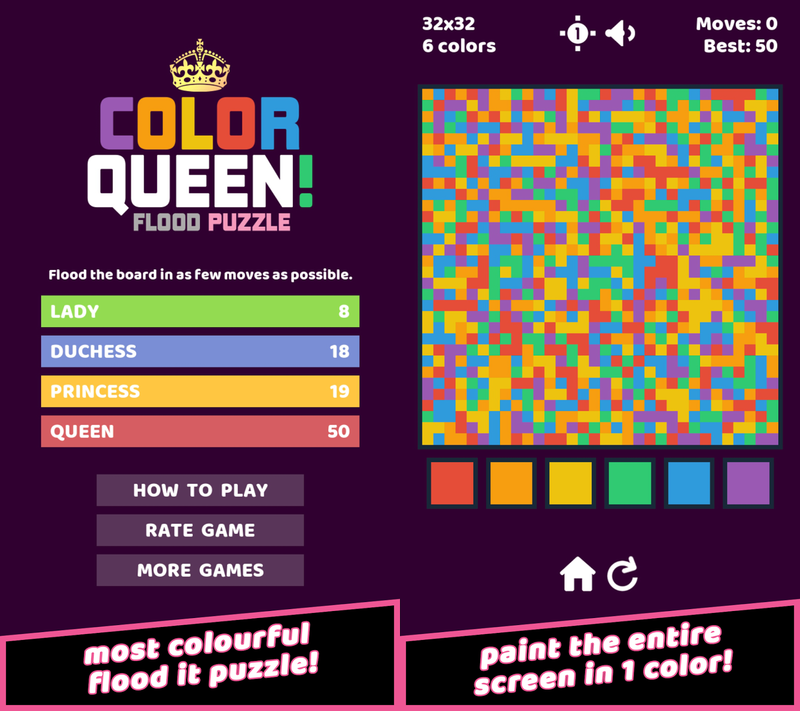 Flood Puzzle once and you'll want to play this beautiful color flood game more. Addictive and Lots of fun! You can now download the Color Queen! Flood Puzzle from the official Google Play store. HWDOT is a developer and publisher of casual games for mobile including Pinkie Pom, ZEL, Flower 2048, 144 Blocks Puzzle, Lolly Pop Bubble Shooter, Pixel Zombie Sniper, 1001+ Emoji Puzzles, and Color Queen! Flood Puzzle. We specialize in delivering free-to-play mobile games to markets around the world. For more information, please visit www.hwdot.com. Title : Color Queen! Flood Puzzle, the most colourful puzzle game released on Android! 0 comments on "Color Queen! Flood Puzzle, the most colourful puzzle game released on Android!"